Dixie takes us to the Kentucky Derby, where the fashions are almost as thrilling as the race itself! It’s known as the “Most Exciting Two Minutes in Sports”, “The Run for the Roses”, and is the oldest continuing sporting event in the US. But more importantly, it just might be the most fashionable sporting event! That’s right! Ladies get out your ostentatious hats. Gentlemen lay out your seersucker suits. It’s Kentucky Derby time! 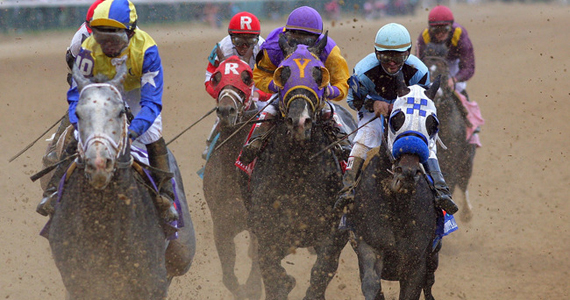 The Kentucky Derby is run the first Saturday in May at Churchill Downs in Louisville Kentucky. It’s a “Grade 1” stake’s race for three year old thoroughbreds, and the first leg of the US Triple Crown. The course is 1.25 miles long and with horses traveling at an average of 45 mph, so the race is over pretty quickly. In that short amount of time one winner is draped in a blanket of roses and awarded $1,425,000. Which probably isn’t that much money compared to how much it cost to breed, train, and have a horse run, but I digress. Let’s talk about jockey attire instead! Ever wonder why jockeys are so fabulously colorful? Ok for most of you I’m guessing you didn’t, but I did. I mean come on there’s a whole lot of pink going on for me not to wonder why. Anyway this came about in the early 18th century before horses were assigned numbers. Horse owner’s tracked their horses by using racing silks or color. This tradition is carried on today, with jockeys wearing the colors of the horse’s owners. And with a large race like the Kentucky Derby, silks have become quite colorful. The Jockey’s colorful silks stem from a tradition that started in the early 18th century. The Derby is also known for some great southern traditions, the main one being drinking. The official drink of The Derby is the Mint Julep, which is made of bourbon, mint, and a sugar syrup, and is very refreshing on a hot summer day. It’s traditionally served in a silver julep cup but, of course, is now served in a souvenir cup. It may not sound delightful to some but it is quite a popular drink, over 120,000 are served during the derby. Seriously, this is one of my favorite sporting events, and I’m sure you can guess why. I mean let’s face it. Any event that involves gloriously large hats and cocktails, I’m in. The fact that men are dressed to the nines and actually look like gentleman is an added bonus. Traditionally the attire for the derby is “dress to impress”, which means you better look good, honey, because everyone is judging you. And judge you they will, especially me. For every well dressed person there’s a hot mess right behind. So let’s aim for a little less hot mess and a little more derby chic. Here’s a few tips to guide you in the right direction. Stick with the basic principal of less is always more! If you want to wear that explosion of feathers and flowers on your head, by all means go for it! Just keep the dress simple with minimal accessories. And vise versa, wear a simple hat with a busy dress. Don’t think you get off so easy guys. Keep it light and breezy! Seersucker and bow ties may seem nerdy to you, but trust me, women love it! Just keep this in mind when selecting a jacket, if you can buy the same print in little boy shorts at JCrew, you might want to rethink it. Finally, if all else fails, just own it! Prance around like you own that place and no one will notice the atrocity you decided to go with. Attitude goes a long way when it comes to making an outfit work for you. And if that fails, it’s probably a lost cause. Just get to drinking. With over 120,000 mint juleps served, people are probably not exactly seeing straight, and you should probably join them. When the worlds of fashion and sport collide, we turn to Dixie Monroe, our resident fashionista. She brings her charm and grace from below the Mason Dixon line, and answers the important question... What the eff is he wearing?